Senator Jen Metzger, Assemblywoman Aileen Gunther, Liberty Supervisor Brian Rourke, Liberty Mayor Ronald Stabak, Thompson Supervisor Bill Rieber, Callicoon Supervisor Tom Bose, Sullivan County Legislature Chair Louis Alvarez and Delaware County Chamber of Commerce President Ray Pucci all made remarks at a press conference on Friday, expressing their deep concerns over the Governor’s proposed cuts to Aid to Municipalities (AIM) funding. LIBERTY – Senator Jen Metzger, Assemblywoman Aileen Gunther, Liberty Supervisor Brian Rourke, Liberty Mayor Ronald Stabak, Thompson Supervisor Bill Rieber, Callicoon Supervisor Tom Bose, Sullivan County Legislature Chair Louis Alvarez and Delaware County Chamber of Commerce President Ray Pucci all made remarks at a press conference on Friday, expressing their deep concerns over the Governor’s proposed cuts to Aid to Municipalities (AIM) funding. Letters were also read from Hamden Supervisor Wayne Marshfield, and Warwick Supervisor Michael Sweeton writing on behalf of the Orange County Association of Towns, Villages & Cities. Assemblywoman Gunther explained. “Fifty-nine million dollars is really a drop in the bucket, a small percentage, but for our rural areas this money is a lifeline. Every penny counts.” She went on to talk about the importance of the $552,000 that would be lost in the district she represents. The Supervisors and Mayors shared what the proposed cuts would mean for their towns and villages, from losing staff to cutting important programs like local clean-ups or road maintenance. “You can’t bleed a stone and that’s exactly what this proposal is doing,” said Senator Metzger. “I served as a Town Councilwoman and previously as a Deputy Supervisor. I have a deep understanding of what every single penny we have means as a local government,” she continued, stating that “local governments are the most resourceful form of government there is.” She went on to promise to fight not only for restoring AIM funding, but for an increase and vowed to also protect funding for extreme weather and the Consolidated Local Street and Highway Improvement Program (CHIPS) funding. In early January, Governor Cuomo released his proposed budget for the 2020 fiscal year, slashing $59 million in funding for local governments through the Aid to Municipalities (AIM) program, impacting a considerable number of villages and towns across the state who have not seen an increase in AIM funding for over a decade. In the 42nd district, it will impact all 19 villages and 31 of the 37 towns. For municipalities, this constitutes crucial funding to ensure balanced budgets and adequate services for their residents. Both Metzger and Gunther have pledged to fight to not only restore this funding, but for a long overdue increase. 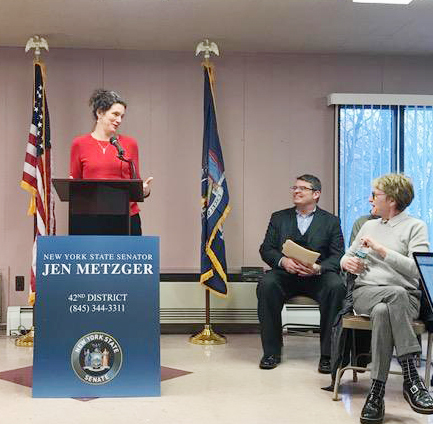 Jen Metzger represents the 42nd Senate District, which includes all of Sullivan County and parts of Delaware, Orange, and Ulster Counties. Senator Metzger serves as Chair of the Agriculture Committee and sits on the Environmental Conservation, Education, Health, Energy and Telecommunications, and Local Government Committees. This event was live streamed on the Senator’s Facebook page at www.facebook.com/SenatorJenMetzger.